Andy Findon is Europe’s most recorded flute player who can be heard on countless movie and TV soundtracks, alongside albums for a long list of international artists. His own releases include ground-breaking and innovative premières, including his own arrangements of work by composers such as Michael Nyman. Andy is the longest serving member of The Michael Nyman Band, playing baritone saxophone and flutes on Michael’s soundtracks and concert tours since the early 1980’s. Although training originally as a classical flautist, these experiences led his career to diversify, covering almost every musical genre, duetting with Pat Metheny, playing with artists such as Stevie Wonder, Joni Mitchell, Tony Bennett, Cilla Black, The Beach Boys and Katherine Jenkins to name but 5 widely contrasting performers. Andy also appears regularly performing works by Karl Jenkins and other successful composers, such as Hans Zimmer, performing the solo Duduk in live performances of his Gladiator movie score. In 1998 Andy performed tin whistle live in the interval act at the Eurovision Song Contest in Birmingham and was Mike Oldfield’s recorder player (in Dulci Jubilo) at the 2012 Olympics Opening Ceremony. He is a member of the iconic, award winning (BBC Radio 2 Best Live Act 2012) “folk-rock” band The Home Service, the legendary “medieval prog-rock” band Gryphon and plays regularly with the major London Symphony orchestras as well as chamber orchestras and groups across the capitol. 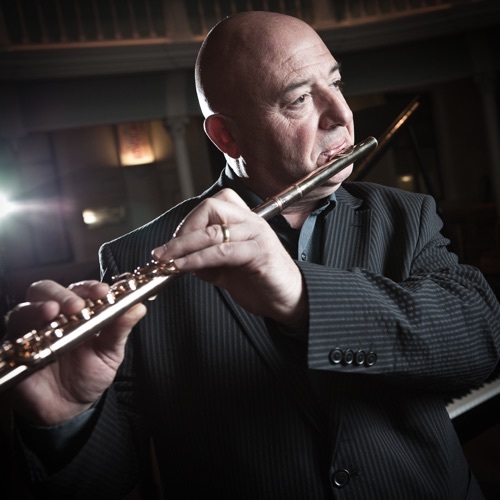 He is a close collaborator with pianist/composer Geoff Eales and is pioneering Geoff’s significant flute repertoire with the album “The Dancing Flute”. Andy is also known as London’s foremost “ethnic” instrumentalist, performing on a kaleidoscopic array of unusual woodwind instruments, alongside the more common instruments of the flute, saxophone and clarinet families. He has contributed extensively to the “Spitfire” sample library with work on both orchestral and ethnic instruments, including the release of the “Andy’s Kitbag” series. As a composer, he has produced and performed hundreds of music “library” tracks which are played across the media regularly. Andy is a “Pearl Flutes International Artist” and the proud owner of the platinum flute built for Geoffrey Gilbert in 1950 by Charles Morley.